The last few weeks in Korea and Japan felt like a vacation…yes, a vacation from our travels. As weird as that sounds, it’s probably the best way to describe it. Being with Jason’s family in Korea and then travelling with Jeanne and Dave in Japan felt like we were taking a bit of a break from our usual world of hostels, shared bathrooms, and eating at street stalls. 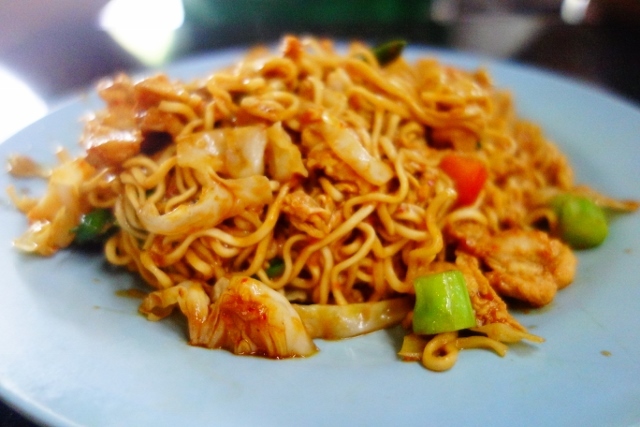 Don’t get me wrong, we love eating at street stalls, but we also love eating at good restaurants. So after our “vacation” in Korea and Japan, we got back into “travel mode” after parting ways with Jeanne and Dave. 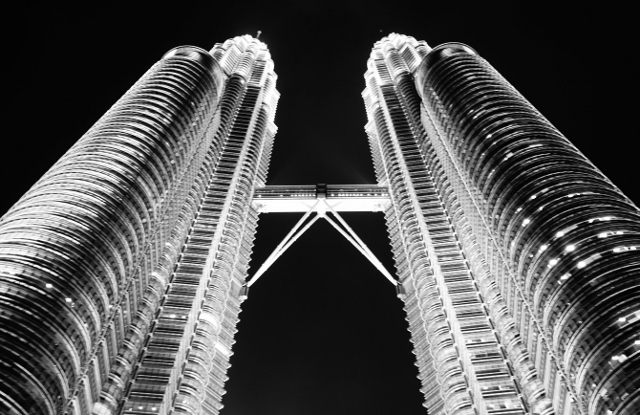 Up next in our travel adventures was Malaysia – specifically the bustling capital of Kuala Lumpur (known as KL by the cool people – and obviously we are cool *wink*). We were really excited to visit this city and were looking forward to experiencing the mix of modern metropolis with old-world orient. What we were NOT prepared for was the oppressive (to the point of almost unbearable) humidity and heat. On a daily basis, the temperature hovered around 35°C, and with humidity it felt like 44°C! That kind of heat is fine if you’re on a beach but not if you’re stuck in a concrete jungle. 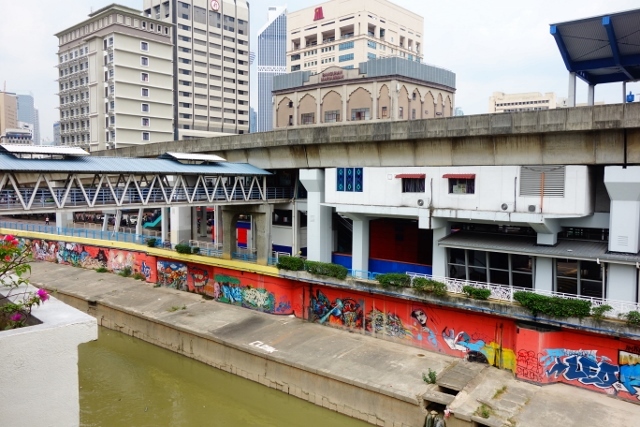 Although KL boasts several modern transit systems that interconnect, we found this multi-transit system really confusing and difficult to navigate. After a few weeks in Korea and Japan, we had become a little spoiled by their clean, fast, and efficient metro systems. 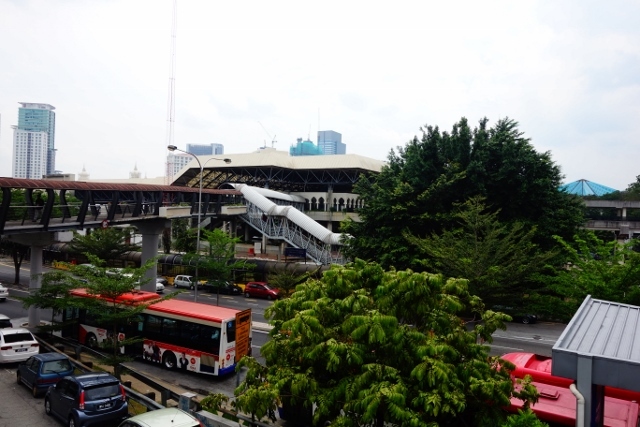 KL has monorail lines, commuter train lines, and skytrain lines that all tangled up into a jumbled mess. A confusing network of pedestrian walkways, tunnels, and bridges around the city. Notice the lack of sidewalks. We decided to try our hand at exploring the city by foot. But the pedestrian infrastructure also proved to be confusing and difficult to navigate. Networks of pedestrian walkways, tunnels, and bridges that connect from building to building replaced normal pedestrian sidewalks. Trying to get from point A to point B meant either scampering across a 6-lane highway or taking a 30-minute detour through underground tunnels and pedestrian bridges. Bridges over random waterways. It’s liked they built all the buildings without any sort of plan of how they would get people from one building to another. We spent our first day walking around our neighbouhood while trying to stay in the shade. 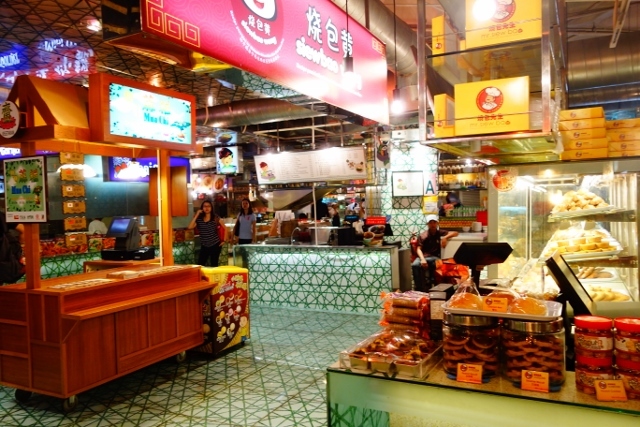 Jason had read about the indoor hawker stall food centre called Lot 10 Hutong. 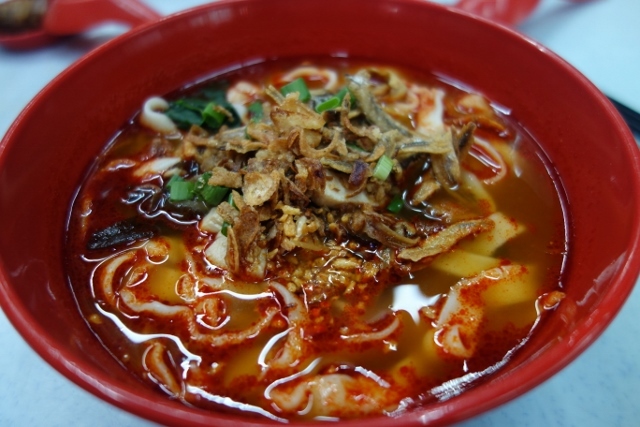 Described as a “gourmet heritage village”, it pulls together a hand-picked lot of the best hawker stalls across Malaysia and places them in an clean, air-conditioned indoor food-court. Normally, I prefer the grimier, authentic street food experience. But in this ridiculous heat, “indoor” and ‘air-conditioning” were right up my alley. Jason and I both got Chinese-influenced dishes. 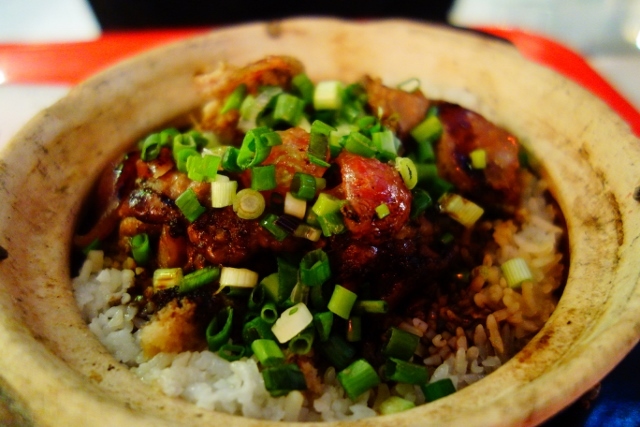 I ordered a delicious wine chicken & mushroom noodle soup and he got a claypot chicken rice dish. After cooling off and filling up, we were ready for round two of exploration. 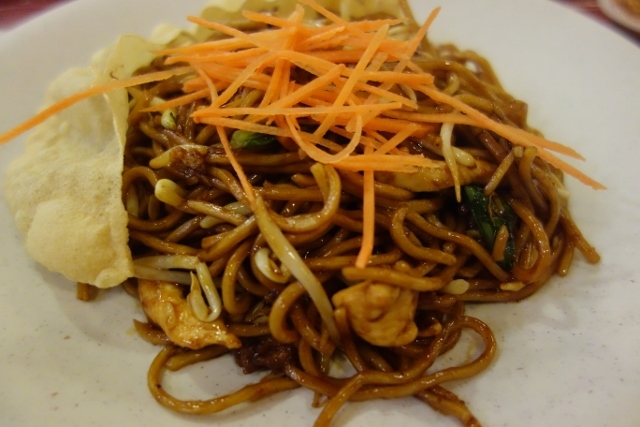 However, we quickly found out that Kuala Lumpur doesn’t have many sights to take in – people mainly come here for two things: shopping and eating. 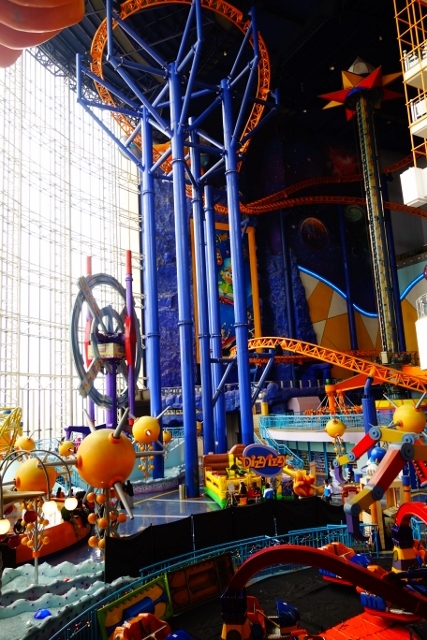 The expansive amusement park inside one of the malls – puts West Edmonton Mall to shame! The malls in Malaysia are insane! Now normally, I love shopping and have no problem with spending hours in malls and markets perusing the sales racks. However, backpacking for 6 months means you have to be really, really picky with what you pick up along the way. “Do I really want to carry this around for the next few months?” is a question we ask ourselves a lot. Sure, we can ship things home, but that would get really expensive really quickly and we were already on a tight budget. So unfortunately, no shopping for this girl. Jason, on the other hand, was ecstatic about our limited shopping opportunities. 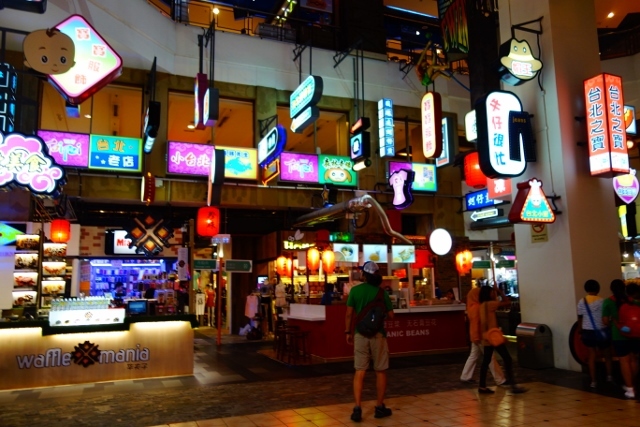 But even though we weren’t planning to do much shopping in Kuala Lumpur, we still ended up visiting quite a few malls – mainly to escape the heat and take advantage of the air conditioning and relatively clean bathrooms…. 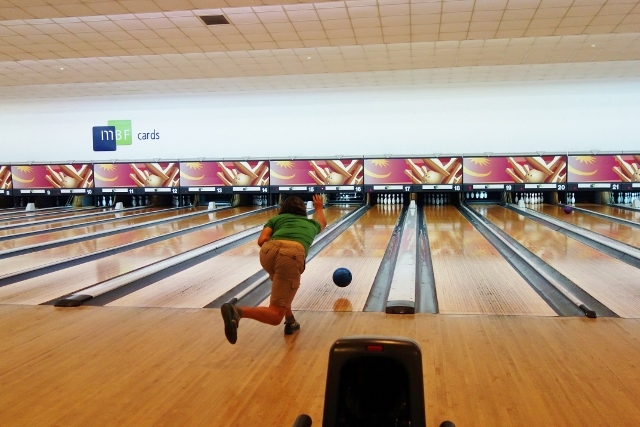 and of course, the bowling alleys! The 20-lane bowling alley inside the mall. Look at that picture-perfect form! 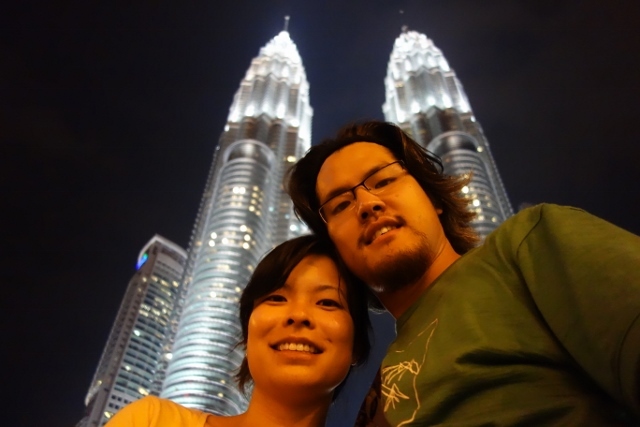 Unflatteringly-angled selfie with the Petronas Towers. Since shopping wasn’t really part of our plan, that just leaves eating on the agenda – which we both had no problems with. 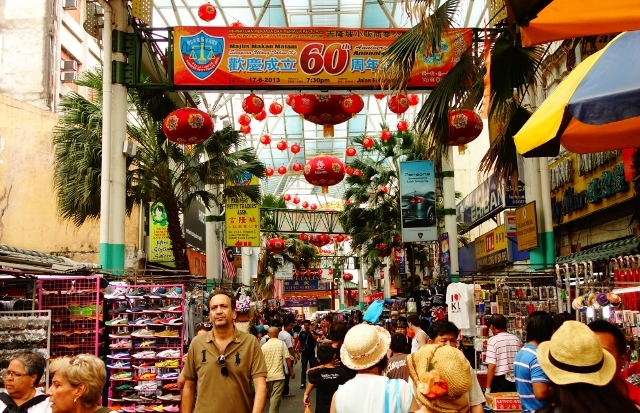 An interesting area to visit in KL is Petaling Street/Chinatown. Pirated CDs, fake Louis Vuitton purses, and street food stalls are crammed into the narrow and bustling pedestrian streets. 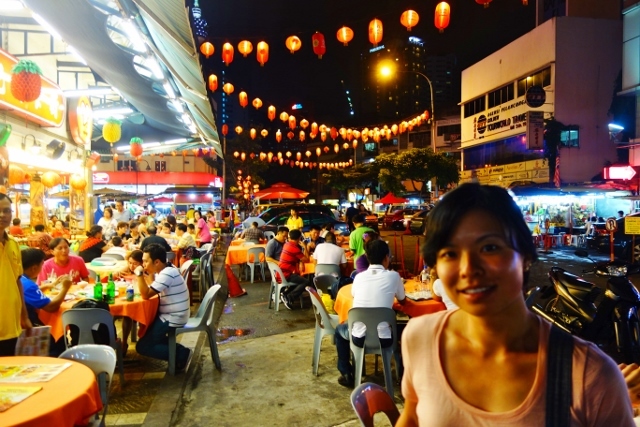 Malaysian culture is a fascinating mix of predominantly Indian, Chinese, Malay. 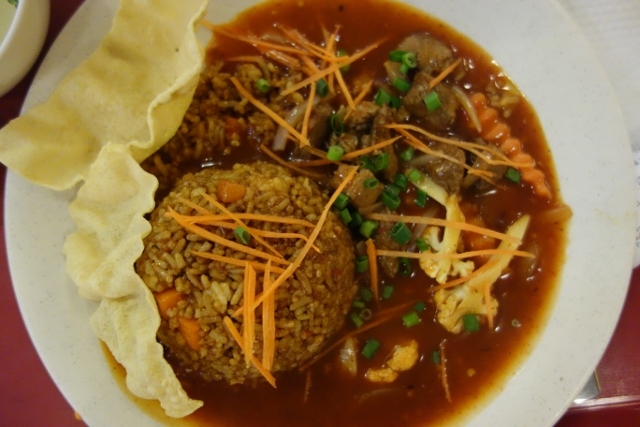 This ethnic mix, along with its geographic location, allows for many influences in Malaysian cuisine – Indian, Chinese, Malay, Indonesian, Thai, and Arabian. 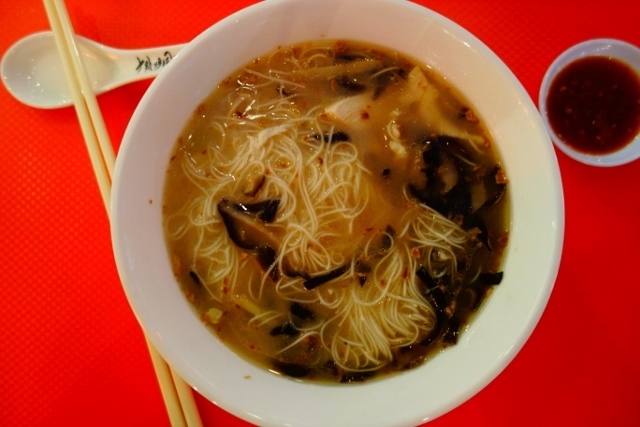 All of that cultural diversity will naturally lead to a melting pot of unique flavours and dishes. 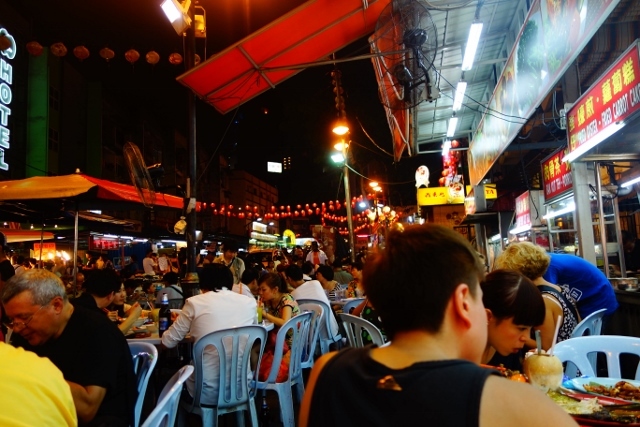 Our eyes and tastebuds were delighted to find this amazing food street, Jalan Alor, almost right next to where we were staying. We walked right past it during the day, barely giving it a second glance. During the daylight hours, it’s pretty easy to miss – but when the sun sets, this street comes to life. 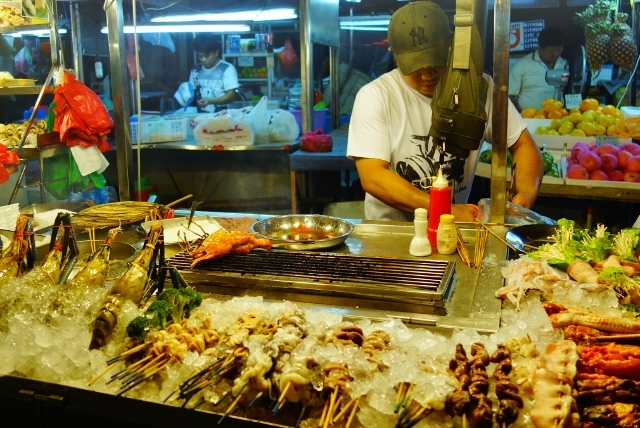 Hawker stalls jostle for space on the streets while restaurants set up plastic stools and tables that spill over the sidewalk right onto the street. 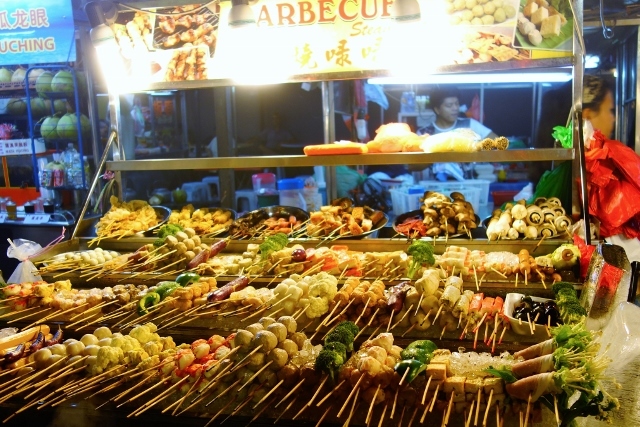 Everything tastes better on a stick, right? 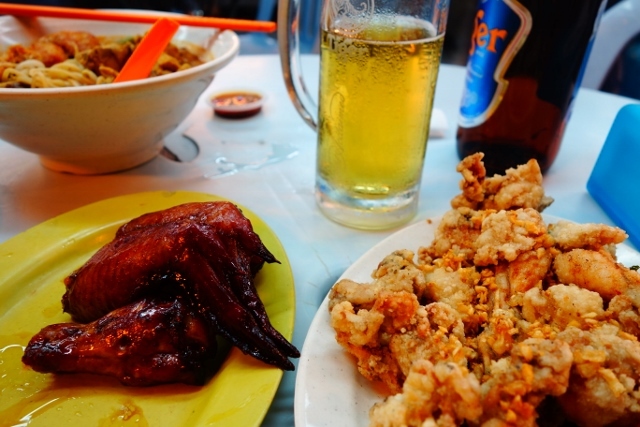 We ordered a feast that night: soy-glazed chicken wings, deep fried frog legs, and curry noodles – with a few cold pints of beer to wash it all down. 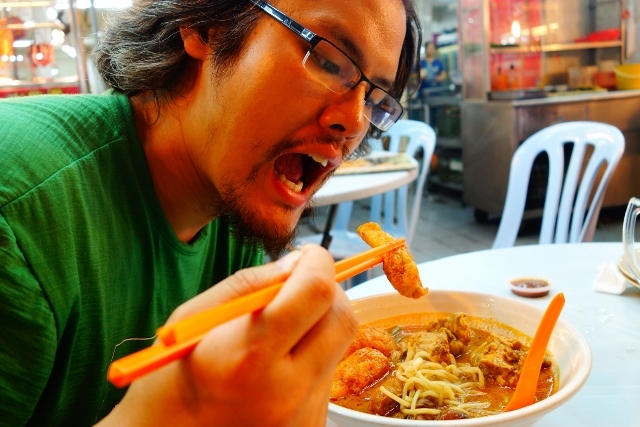 Yes, the food was delicious, but irritated with the frustrating pedestrian infrastructure and the oppressive heat, we decided to hightail it out of Kuala Lumpur after only 2.5 days – the shortest we’ve spent in any one place so far. Off to the beach – the only place one should be in 44°C weather!